I was asked recently, Via facebook, where I write. meaning if there was a place as part of a ritual with my writing. As where it isn’t ritualized and I write anywhere, diners, the car, on my bed, in the yard – where ever, you see the inspira moves around a bit. But the majority of it is done in a little room, painted red at the back of my house in a secluded part of Elgin. 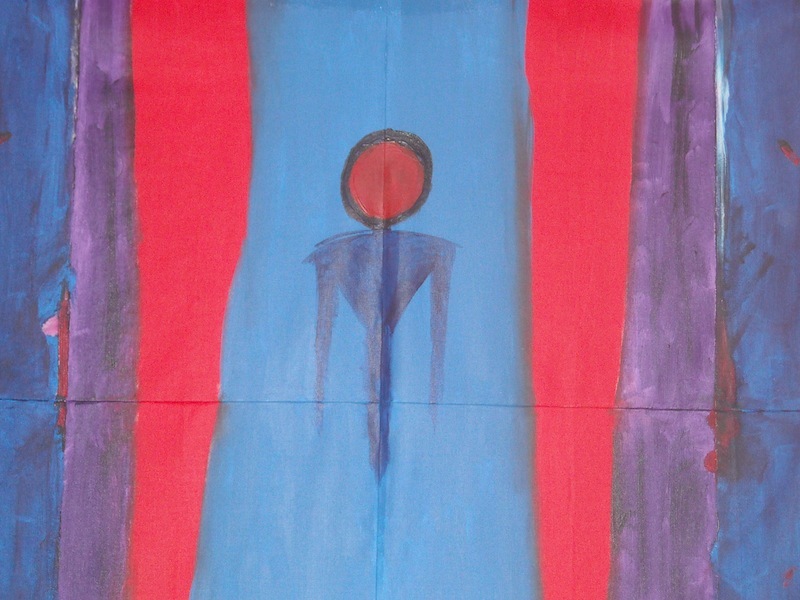 a painting of mine – the sides and top are cut off so it’s like watching a letterbox movie in pan and scan – I face this when I write or it is in front of me but I face the page. 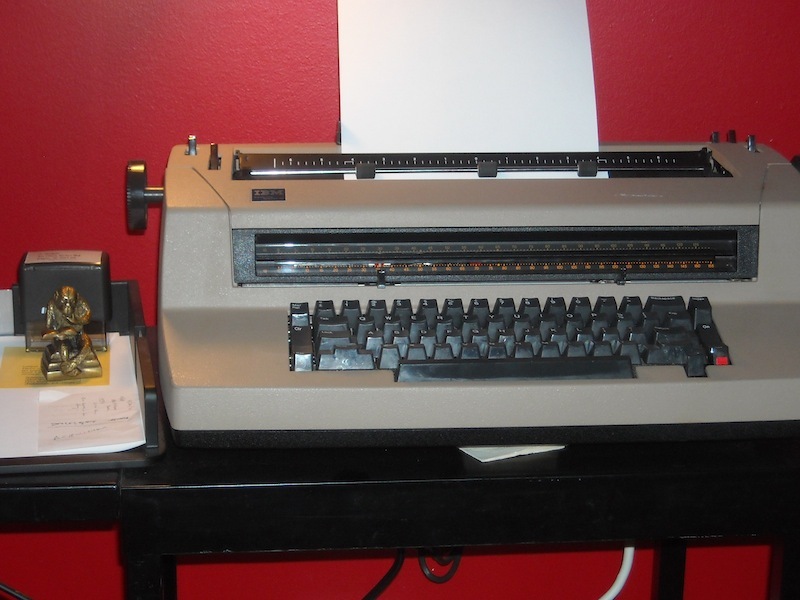 My IBM Selectric III in it’s newest position with a stack of poetry and prose under a brass monkey reading a book. My return address on a stamp. within reach. 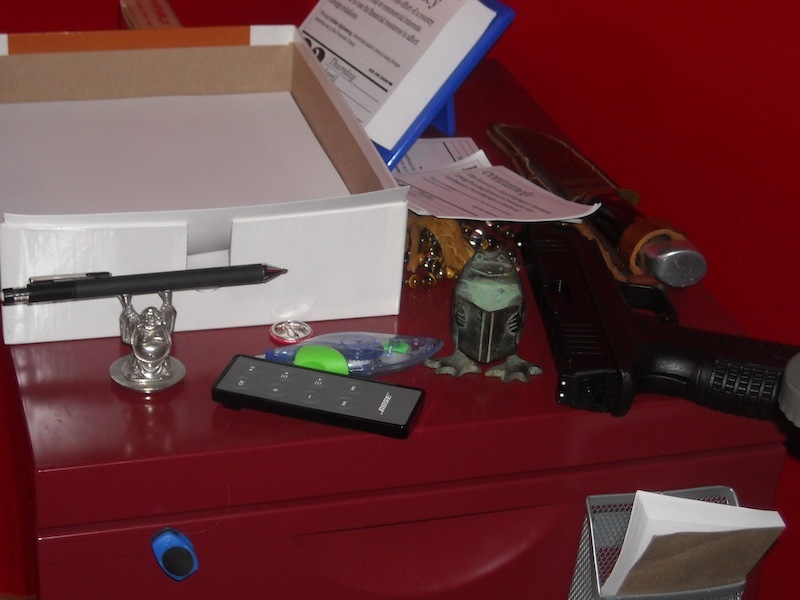 Normally there is a coffee cup there but I wasn’t writing at the time, a stack of nice paper that my wife keeps me in, a page a day, a XDm 9mm – loaded, an old hunting knife, the Bose remote, meditation beads under the page a day tear outs, a frog reading a book, white out and Maitreya Buddha holding my mechanical pencil. and scratch paper. sometimes it’s a colt .45 or a .38 special but all the rest is a constant. I love seeing where writers write. We each have our own little spaces and they're so individualized – nooks and niches of nuance. I, too, have my special space like yours, but also go to the couch or outside, etc., depending on The Muse and mood. Love your space – and the words it inspires/produces. I should photo the rest of the room – couch, bookshelves – pretty small and not much in it but I love the wood floors and my throw rug. I used to write naked but that was before having a child and now I write fully clothed. not that you really needed to know that. oh, and thank you for the compliment of calling me a writer. I like that, not many people I know refer to me that way.